With the 2014 Farm Bill recently signed into law, NSAC is doing a seven-part series here on our blog that delves into the details of the bill for sustainable food and farming systems. This first post summarizes the big picture funding decisions reflected in the final bill. Coming posts will look at specific issues within the farm bill in more detail. A post from last week provided a broad overview of the substance of the new bill. One of the overriding themes of the three-years-in-the-making farm bill has been reducing overall funding by a modest amount. In 2011, the House and Senate Agriculture Committee leadership attempted to put together a bill quickly to pass onto the special Super Committee that would be dealing with a deficit reduction package. That 2011 farm bill proposal proposed to save $23 billion over 10 years, the same exact sum that the new 2014 farm bill proposes to save, if one includes direct farm bill savings as well as automatic budget cuts that affect farm bill spending but are outside of the bill’s purview. Those automatic (“sequester”) meat ax-type cuts took effect as a result of the failure of the Super Committee to pass a government-wide deficit reduction package. Cutting $23 billion — slightly more than 2 percent – from total farm bill spending has been among this bill’s leading mantras from beginning to end, though that that otherwise fairly straight path took multiple detours in the House of Representatives along the way. This consistency is quite remarkable given that Congress never provided any budgetary directives to the Agriculture Committees for this farm bill, and hence there was no magic number the bill’s authors needed to meet other than the ones they set themselves. That 2011 draft bill produced just as the Super Committee process was falling apart would have cut spending on commodities (traditional and insurance subsidies combined) over the next 10 years by $15 billion, on conservation programs by $6 billion, and on SNAP (food stamps) and nutrition programs by $4 billion, while spending an additional $2 billion on a variety of other smaller farm bill programs. The final cuts (including the sequester) for the new bill are $12.7 billion for commodities, $6.1 billion for conservation, and $8 billion for SNAP and nutrition, with an increase to $3.7 billion in new spending for everything else. The final bill’s commodity cuts are smaller than either the Senate-passed bill or House-passed bill, while the conservation cuts split the difference between the two bills. On a percentage basis, accounting for direct farm bill cuts as well as for sequestration, commodity subsidies were trimmed by 8.6 percent, conservation programs by 9.5 percent, and SNAP and nutrition by a small fraction of 1 percent. The conservation cuts represent the first time Congress has voted to slash conservation spending since conservation spending first became part of the farm bill in 1985. In every farm bill since then – 1990, 1996, 2002, and 2008 – the investment in conservation has increased. The size of the cut in the new 2014 bill exceeds the gains from the 2008 bill. When sequestration and backdoor farm bill conservation cuts in annual appropriations bills are added to the equation, a significant share of the gains from the 2002 bill have also cancelled out. While the focus has been on how and where to cut, it is perhaps more relevant to talk about what the new bill proposes to spend. 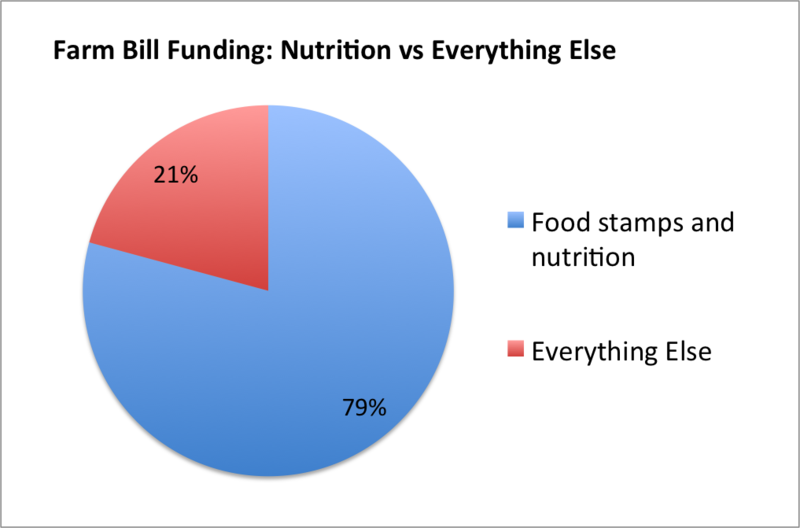 It has always been clear since the get go that the new farm bill would spend close to a trillion dollars over the coming decade, with the bulk of that on SNAP and nutrition programs. That would be true whether the bill included no net savings or $20 or 40 billion in savings, due in large part to the outsize role that the food stamp program plays in the farm bill spending regime and the run-up in food stamp costs due to the economic recession and slow recovery. Here is the way the final bill is estimated to break down between SNAP and nutrition programs and the rest of the bill, including commodities and conservation. Let’s look more closely at the non-nutrition titles part of the bill. The big story here for quite a few years now has been the growing role of crop insurance subsidies in the overall farm safety net regime, a trend further accelerated by the new farm bill. The other significant change is the re-positioning of conservation spending as larger than the commodity programs in terms of total projected spending. Another trend is the continuing investment of smaller slices of total farm bill resources into areas outside of the big three (commodities, nutrition, and conservation). Funding these other areas – renewable energy, specialty crops, research, rural development, organics, beginning farmers, local food, etc. – is still a fairly new phenomenon, starting up in a small way in the 1996 Farm Bill and only hitting its current stride in the 2008 Farm Bill. The renewal of the 2008 funding is significant, as is the advent of permanent spending for the major specialty crop programs and for the Rural Energy for America Program. With regard to funding, Congress analyzes its work on a bill relative to a budget baseline established by the Congressional Budget Office (CBO). CBO assesses the impact of each new policy or program based on whether it will increase or decrease spending relative to the baseline. It is important to remember that the baseline is always changing, even though Congress locks in a baseline at the start of its work on a bill. Just today, for instance, CBO is releasing a new baseline that will show an increase in costs for the old 2008 Farm Bill’s commodity and nutrition programs. In March they will produce a baseline that will re-estimate the costs of the new 2014 Farm Bill that may well show it costs a bit more (saves a bit less) relative to the numbers being used in this post and widely used by members of Congress and the media. There are some aspects of estimating costs that are fairly straightforward. For instance, while estimates for conservation programs may shift slightly from year to year, the CBO estimates for several years down the road are generally very close to the mark. The CBO estimates for most of the smaller farm bill programs are also fairly exacting. The same cannot be said for commodity program and crop insurance costs. Those costs are more volatile because they can change dramatically with the commodity markets. By ending the direct payment feature of commodity programs and increasing farm support based on fluctuations in commodity prices and revenue, the new farm bill in fact increases the difficulty in predicting what programs will cost three or five or ten years from now. Following the pattern established by the draft bill in 2011, the new farm bill combines existing easement programs into a single overarching umbrella program. Importantly, the new bill provides the easement programs with permanent funding, rather than only 5-year funding. In the past, the Wetlands Reserve Program and Grassland Reserve Program — two of the three constituent parts of the new single overarching program — had to obtain new funding each farm bill cycle. This “consolidate plus add permanent funding” formula results in a net increase in cost over the next 10 years of $1.2 billion. Another consolidation in the new bill ends the small stand alone Wildlife Habitat Incentives Program and combines some of its functions into the much larger Environmental Quality Incentives Program (EQIP). Combined, the budgetary impact is to hold spending constant. The big cuts in the conservation title were to the Conservation Reserve Program (CRP) – the largest conservation program and the major land retirement program – and the Conservation Stewardship Program (CSP) – the largest working lands program and only advanced conservation management program. The CRP will be cut over the coming years to 24 million acres total, down over 2 million from current levels. That change is estimated to save $3.3 billion over the coming decade. The CSP will be cut immediately to 10 million new acres per year, reducing the program by 28 million acres and an estimated $2.3 billion over the next decade. The biggest change made to farm bill conservation program budget decisions over the course of the process from 2011 to the conclusion in 2014, was the movement from originally including a fair share of EQIP in the mix of spending reductions to in the final analysis holding EQIP harmless. The funding cuts and funding increases made in the farm bill are not the end of the story, however. Unless and until Congress revokes the meat ax automatic cuts known as sequestration, additional cuts will be made each year to all the farm bill conservation programs with the sole exception of the CRP. The CRP will be held harmless. For instance, in the current year, each of the programs other than CRP will be reduced over 7 percent below the funding level stipulated by the farm bill. The exact percentage reduction fluctuates from year to year. So, for instance, the annual appropriations bill has never allowed EQIP spending to exceed $1.4 billion a year, yet the new farm bill mandates EQIP spending that is $3.25 billion greater than the heretofore annual appropriations reduction over the next 10 years. It remains to be seen whether or not any of the additional $3.25 billion will remain as EQIP funding. If history is any guide, it is more likely to be shifted to other annual spending priorities, a result likely to only change when and if the Agriculture Committees organize to defend their spending mandatory decisions for conservation. * Automatic budget cuts known as sequestration will take additional, proportional bites out of all of these programs each and every year through 2024 with the exception of the Conservation Reserve Program. Those cuts will exceed $2 billion and come on top of sequester cuts already made for the past two years while the farm bill has been debated. The 2011 and 2012 figures in this chart reflect the pre-sequestration era, whereas the 2013 and 2014 figures are just the nominal farm bill cuts or additions and actually will be lower due to sequestration. ** All the bills merge the current Wildlife Habitat Incentives Program into EQIP. These numbers reflect the combined program. *** All the bills merge the current Wetlands Reserve Program, Grassland Reserve Program, and Farmland Protection Program into the new ACEP. These numbers reflect the combined program. **** Some columns do not add precisely to the total due to rounding. As NSAC has emphasized for all of 2013 and into 2014, the awful farm bill extension adopted by Congress on New Year’s Day 2013 did not extend the entire farm bill, but rather left a large number of programs without any farm bill funding for 2013. Hence, one central question for the two bills working through the process again in 2013 and into 2014 is how these programs that were left high and dry since October 2012 would be treated. The chart below summarizes the outcomes for the stranded programs that were high on NSAC’s agenda. The overall big picture take away is that USDA will now have over $1.2 billion to invest over the coming five years in a range of the most innovative and transformational programs within the farm bill. Many of the posts that will follow in this series will provide additional detail not only about funding but also about policy outcomes with respect to these critical programs. NSAC used the latest CBO score of the farm bill, program funding levels as reported in the final farm bill text, and our own prior funding analyses to prepare this post. For the sake of the environment, our food should be locally grown and organically grown. Farmers of moderate size should receive a fair price and farm workers a fair wage. As there is a minimum wage though inadequate for workers, there should be a living minimum price for farmers. It isn’t just farmers who will benefit from the farm bill. It also helps rural towns, grocery stores in low-income areas and, most notably, the nation’s 47 million food stamp recipients.